I haven’t blogged in months. Poor effort on my part. Here’s an update to my weight loss rate: it’s begun to abate. In the first month of this year I averaged -1.3KG every week. In the following two months, -0.5KG/week. 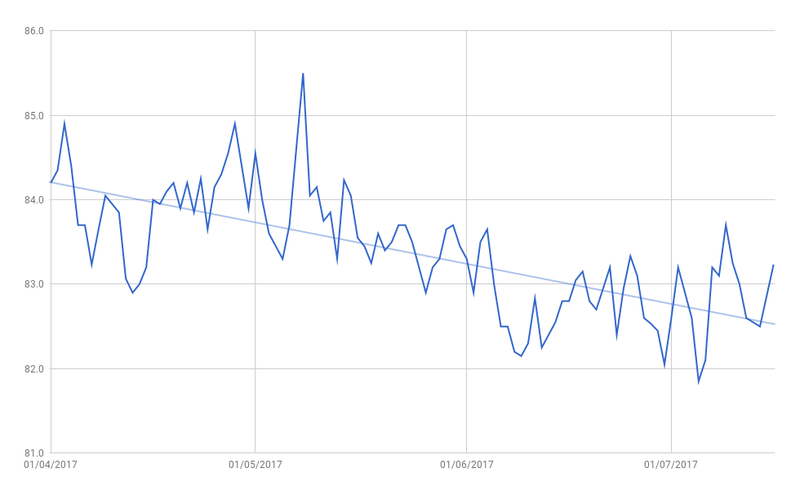 Today, looking back over the last three months, I’ve lost a solitary kilogram, based on my weekly average weight. The line does go in the right direction, so that’s something. Given that I’m not exactly dieting now, this was probably to be expected. Not that I’ve returned to old eating habits. Avocado on brown toast is the new SI unit of breakfast. Meal Prep Sunday is a lifestyle I’ve tried to join, in an attempt to save cooking time as well as enforce a healthier diet, and that’s been interesting if not entirely successful. Cooking six meals at once is a time saver, but many foods aren’t at their best being cooked, frozen, defrosted and then microwaved. Experimentation continues. I’m not exactly where I wanted to be. My target for this point was 80KG, which I have missed. But it’s hard to feel too bad, because while this morning I weigh 82.9KG, that’s an unusual peak following a weekend of wedding canapes, contrasting the dramatic trough of 83.0KG I recorded in April and quickly rose back above. That 80KG target will be retained for the next three months, and hopefully in October I’ll be able to report that I’ve hit it. Fingers crossed, eh?